I've ported the GNU compilers to the Macintosh Metrowerks CodeWarrior environment. This includes the full C and C++ compiler, assembler, linker, and disassembler needed to develop software with the GNU tools. I have released tools for cross-compilation to Motorola 68k, Motorola PowerPC, and Intel x86 Linux, Motorola PowerPC NeXTStep (‘MacOS X’), as well as sparc and x86 Solaris, and ARM embedded systems. This means that you can now use the same CodeWarrior graphical environment to develop software for Linux, Solaris, and NeXTStep. Together with Metrowerks' MacOS compiler and Win32 cross-compiler, this opens up exciting possibilities for cross-platform development from a single source code base! Sorry, the NeXTStep-hosted (‘MacOS X’) CodeWarrior IDE is not currently supported. Instead of downloading the tools, you may also purchase a CD directly from me. First, download the GNU plug-ins. These plug-ins will automatically support all the back ends that you install next. This archive also contains a simple sample project. Finally, you need a set of operating system-specific header files and C libaries for your target system. You can copy these directly from your target system, or use the tiny subset of libc builds that I did that you can download from the ‘libc subset’ column in the table below. The full libc complement (a whopping 0.1 GB per platform) and operating system header files for all three Linux targets is included on the CD. 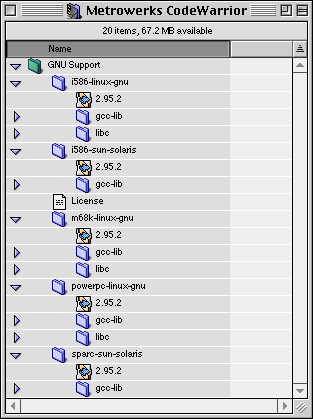 libc for Solaris is not supported by GNU. Note that I cannot legally distribute Solaris headers or libraries— you must obtain these yourself from Sun. Also, the headers and libraries for the NeXTStep target are not included here, but you can simply use the files that come with MacOS X (instructions are included here). Copy the “GNU Plugins” folder into the “CodeWarrior Plugins” folder. Then, install the target back ends you downloaded in a new folder called “GNU Support” (it must be spelled exactly like that) in the Metrowerks CodeWarrior folder. Each target must have its own folder in the GNU Support folder, for example, “powerpc-linux-gnu”. Refer to the figure on the left. That figure also illustrates how to install the headers and libraries. It doesn't really matter where you put them (since you specify their location in CodeWarrior's ‘Access Paths’ preference panel), but the figure shows a reasonable suggestion. All in all, this 600 MB Macintosh HFS disc contains about 16,700 files. The CD is so organized that you can build directly off of it— with the exception of the compilers themselves (which need to be in your CodeWarrior folder), you do not even have to copy anything to your hard disk.